How to Redeem the HKD200 Discount? 1. From now till 15 May 2019 you can make a Flight + hotel OR a standalone hotel booking to any route on U-FLY Holidays during the promotion period with a minimum purchase of HKD2,000 or above and a 3 star and above hotel stay for minimum 2 consecutive nights. 2. Enter promo code “RU3RD” on payment page. 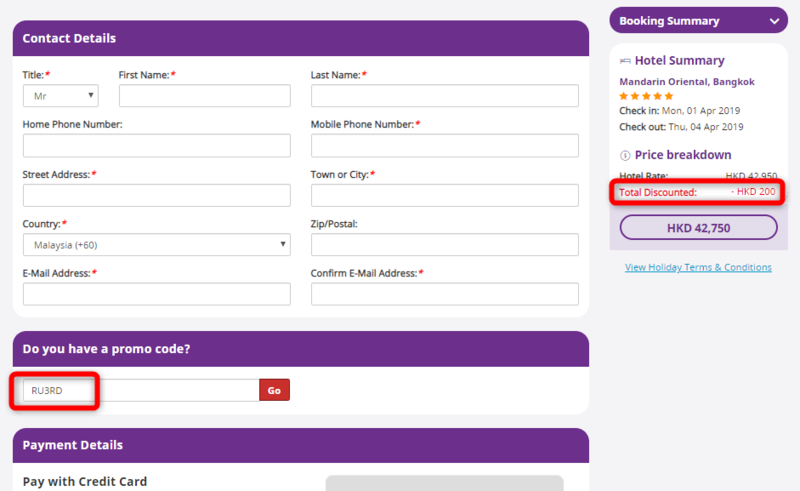 HKD200 discount can be applied on Flight + Hotel or standalone hotel bookings with single transaction of HKD2,000 or above, by entering “RU3RD” into the Promo Code field in the check-out page and clicking “Go” button. Transaction amount excludes taxes, and surcharges. In case of any fraud / fraudulent, or the related transaction does not fulfill all promotion requirements, U-FLY Holidays has the right to deduct the value of the applied Promo Code discount from credit card, without further notice.